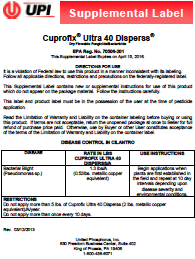 A supplimental label has been obtained for the use of Cuprofix Ultra Disperss for the suppression of bacterial blight (Pseudomonas sp.) in cilantro. Apply Cuprofix Ultra Dispress at 1.3 lb/A on a 10 day interval. Bacterial blight of cilantro is caused by a opportunistic bacterium that is ubiqutious in most soils. Especially, in soils where Cilantro and Parsley have been grown in the past. Once in the soil the bacterium can survive for a long time. The bacterium can also be seed-borne. Unfortunately, there are no current seed treatments to help reduce the chances for bacterial blight.